The world’s fastest-growing false religion tells us that our faith is a “force,” and the words we speak have the power to create something new. 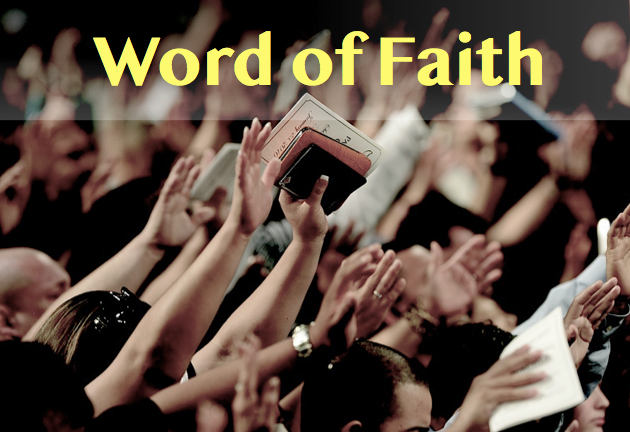 The Word of Faith proponents promise we can obtain health, wealth, success, and more if we simply have enough faith. Biblical Christianity says no. Known as Positive Confession, Name-it-and-claim-it, Word of Faith or Word-Faith. Sometimes (but not always) linked with the New Age and with New Apostolic Reformation (NAR). The WOF movement grew out of the Pentecostal movement in the late 20th century. Its founder was E. W. Kenyon, who studied the metaphysical New Thought teachings of Phineas Quimby. Mind science (where “name it and claim it” originated) was combined with Pentecostalism, resulting in a peculiar mix of orthodox Christianity and mysticism. Kenneth Hagin, in turn, studied under E. W. Kenyon and made the Word of Faith movement what it is today. Step number four is “Tell it so others may believe.” This final step might be considered the Faith movement’s outreach program. Faith teachers like to teach, based upon serious mishandling of passages such as John 10:31-39 and II Peter 1:4, that Christians are “little gods.” Copeland says, “Now Peter said by exceeding great and precious promises you become partakers of the divine nature. All right, are we gods? We are a class of gods!” (Christianity in Crisis, p. 116). Benny Hinn declares, “God came from heaven, became a man, made man into little gods, went back to heaven as a man” (Christianity in Crisis, p. 382 n. 43). Earl Paulk wrote, “Until we comprehend that we are little gods and we begin to act like little gods, we cannot manifest the kingdom of God” (Satan Unmasked, p. 97). While man is glorified, God is humiliated in the Faith system. Copeland claims that God is a being who stands about 6’2″-6’3″, weighing somewhere in the neighborhood of a couple of hundred pounds, and has a hand span of 9″ across (Christianity in Crisis, p. 121). Copeland also declares “Adam was the copy, looked just like (God). If you stood Adam beside God, they looked just exactly alike. If you stood Jesus and Adam side-by-side, they would look and sound exactly alike” (Christianity in Crisis, p. 137). “Man, I feel revelation knowledge already coming on me here. Holy Spirit, take over in the name of Jesus. … God the Father, ladies and gentlemen, is a person; and He is a triune being by Himself separate from the Son and the Holy Ghost. Say, what did you say? Hear it, hear it, hear it. See, God the Father is a person, God the Son is a person, God the Holy Ghost is a person. But each one of them is a triune being by Himself. If I can shock you — and maybe I should — there’s nine of them. Huh, what did you say? Let me explain: God the Father, ladies and gentlemen, is a person with his own personal spirit, with his own personal soul, and his own personal spirit-body. You say, Huh, I never heard that. Well you think you’re in this church to hear things you’ve heard for the last 50 years? You can’t argue with the Word, can you? It’s all in the Word (Christianity in Crisis, p. 123-124). Hinn, under fire, later retracted his remarks, only to reaffirm them two years later. Jesus supposedly told Copeland, “They crucified me for claiming that I was God. But I didn’t claim I was God; I just claimed I walked with Him and that he was in me” (Christianity in Crisis, p. 137-138). Many of the Faith heresies concerning God can be traced to the notes found in Dake‘s Annotated Reference Bible. Christ was re-created on the cross from divine to demonic. To put it in Faith vernacular, Jesus took on the very nature of Satan himself. Your redemption was not secured on the cross, but in hell. In fact, many Faith teachers claim that Christ’s torture by all the demons of hell was a “ransom” God paid to Satan so that He could get back into a universe from which He had been banished. Jesus was reborn (or born again) in the very pit of hell. Christ was reincarnated through His rebirth in hell and that those who (like Christ) are born again can become “incarnated” as well. Thus, Faith teachers take Christ, the spotless Lamb, and pervert Him into an unholy sacrifice on the cross (Christianity In Crisis, p.153). While many, even within the Word-Faith churches, are unaware of some of the doctrinal heresies of the movement, none can plead ignorant of the strange and bizarre practices and emphasis of its leaders. The following things are standard occurrences in virtually every one of their television broadcasts, evangelistic campaigns, and church services. Nothing will create more euphoria in the average person than the promise to make them wealthy, and this the Word-Faith leadership knows very well. The Word-Faith teacher’s lifestyle is clearly identified by opulence, luxury, riches, and the assurance that all of this can be his followers as well — if only they apply certain principles. “Being poor is a sin, when God promises prosperity. New house? New car? That’s chicken feed. That’s nothing compared to what God wants to do for you” (Charismatic Chaos, p. 285). “If you’ve got one dollar faith and you ask for a ten-thousand dollar item, it ain’t going to work. It won’t work. Jesus said, ‘According to your [faith],’ not according to God’s will for you, in His own good time, if it’s according to His will, if He can work it into his busy schedule. He said, ‘According to your faith, be it unto you'” (Charismatic Chaos, p. 286). “Give $10 and receive $1000; Give $1000 and receive $100,000 … give one house and receive one hundred houses or a house worth one hundred times as much. Give one airplane and receive one hundred times the value of the airplane. … In short, Mark 10:30 is a very good deal” (p. 54). The “name-it-and-claim-it” pundits are not content with mere wealth; they want to feel well enough to enjoy their prosperity. So do most of their listeners. So while you are giving away wealth, why not dispense health as well? “The first step to spiritual maturity is to realize your position before God. You are a child of God and a joint-heir with Jesus. Consequently, you are entitled to all the rights and privileges in the kingdom of God, and one of their rights is health and healing” (p. 25). “The Bible declares that the work was done 2,000 years ago. God is not going to heal you now — he healed you 2,000 years ago. All you have to do today is receive your healing by faith” (Rise and Be Healed, p. 44). Of course reality, in the form of sickness, has to be faced even by the Word-Faith leaders. Fred Price may proclaim “we don’t allow sickness in our home,” but his wife still has cancer. Kenneth Hagin brags that he has not had a headache, the flu, or even “one sick day” in nearly 60 years, but he has had four cardiovascular crises. Paul Crouch may have healed Oral Roberts of chest pains on a TBN Broadcast, but it didn’t stop Oral from having a heart attack a few hours later (Christianity in Crisis, pp. 237-238). How are these things explained away? Predictably, by blaming them on the devil. Sickness in the Word-Faith camp is usually seen as satanic attacks that must be repelled by words of faith (i.e., “positive confession”). “It was three days before Christmas 1973. The sun was still rising on that cold, misty Toronto morning. Suddenly He was there. The Holy Spirit entered my room. He was as real to me that morning as the book you are holding in your hand is to you. For the next eight hours I had an incredible experience with the Holy Spirit. It changed the course of my life (Rise and Be Healed, p. 1). “I saw Jesus walk into my bedroom. He was wearing a robe that was whiter than white and a deep red mantle was draped over the robe. I saw his hair. I looked into His eyes. I saw the nailprints in His hands. I saw everything. … When it happened, I was asleep, but suddenly my little body was caught up in an incredible sensation that can only be described as ‘electric.’ It felt as if someone had plugged me into a wired socket. There was a numbness that felt like needles — a million of them — rushing through my body. And then the Lord stood before me while I was in a deep, deep sleep. He looked straight at me with the most beautiful eyes. He smiled, and His arms were open wide. I could feel His presence. It was marvelous and I’ll never forget it” (Rise and Be Healed, p. 22). “What I really felt, though, was that this surge of power was cleansing me — instantly, from the inside out. I felt absolutely clean, immaculate, and pure. Suddenly I saw Jesus with my own eyes. It happened in a moment of time. There he was. Jesus” (Rise and Be Healed, p. 31). “Once, my mother was cleaning the hallway while I was in my room talking with the Holy Spirit. When I came out, she was thrown right back. Something had knocked her against the wall. I said, ‘What’s wrong with you, Mama?’ She answered, ‘I don’t know?’ Well, the presence of the Lord almost knocked her down” (Rise and Be Healed, p. 42). “Are you ready to meet the Holy Spirit intimately and personally? Do you want to hear His voice? Are you prepared to know him as a person? That’s exactly what happened to me, and it drastically transformed my life. It was an intensely personal experience, and it was based on God’s Word. You may ask, ‘Was it the result of a systematic Bible study?’ No, it happened when I invited the Holy Spirit to be my personal friend. To be my constant guide. To take me by the hand and lead me ‘into all truth.’ What He will uncover and reveal to you in Scripture will make your study of the Bible come alive” (Rise and Be Healed, p. 48). Both the Word-Faith leaders and their followers make the same mistake of basing their lives on experiences and feelings rather than upon the inspired Word of God. Many Word-Faith preachers broadcast their services and campaigns on the largest Christian-based television network in the world: The Trinity Broadcasting Network (TBN), capable of televising the Faith message all over the world. The Bible defines “faith” as “the assurance of things hoped for, the conviction of things not seen” (Hebrews 11:1). Our “faith” cannot override the will or nature of God. But our faith that He is able to accomplish all good things for His glory is a necessity for prayer and petition to God. Without faith, it is impossible to please God.